Last week we were focusing on scale drawings. We were also focusing on maths week. The ratio between the scale drawings were 1:2 cm. It means by doubling the the amount of boxes from the top and the bottom. My ratio from the top to the bottom was 22:32. The scale factor was 2. At first I didn't know what scale drawing was until we were given a sheet of example to copy and paste. The most favorite part about my scale drawing enlargement was coloring in the scale drawing. 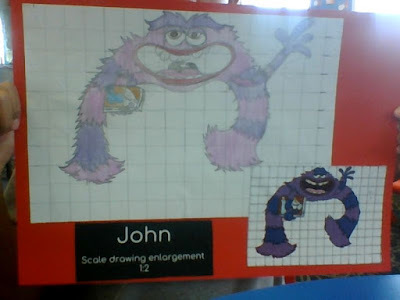 What I found hard about this scale drawing was copying and pasting the monster to a bigger sheet.